Just steps from downtown and the famed nightlife of the Gaslamp Quarter. 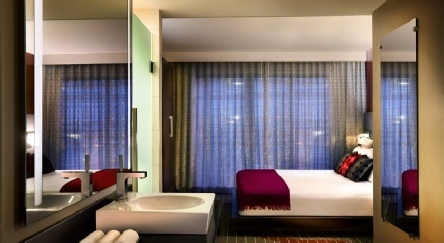 The Hard Rock Hotel San Diego offers bold, contemporary rooms equipped with 42-inch flat-screen cable TV and free Wi-Fi. The bathroom features full-length mirrors and a rain-style shower. Guests of the Hard Rock can enjoy a drink by the rooftop pool at Float or eat at the Nobu classic sushi bar. Maryjane’s restaurant serves classic American cuisine all day. The Rock Spa offers a variety of treatments that can be performed in-suite or within a poolside cabana. Guests also receive free music downloads to serve as a soundtrack for their time at the hotel. 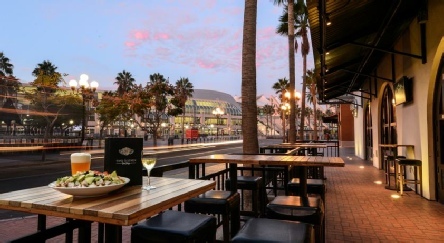 This modern, music-centred hotel stands, featuring a beautiful rooftop pool deck, is located within San Diego’s Gaslamp district. Guests can borrow a free guitar during their stay. 2019 package holidays to the Hard Rock San Diego Prices are per person based on two sharing, including flights, transfers and accommodation, and are subject to availability. Flights from Heathrow - other departures also available, call for details.